Last updated: August 9, 2018 at 11:26pm by Savanah – In November this year, the proposal of three to four privately owned casinos might be on the ballot. Arkansas currently does not allow commercial or tribal casinos in the state. If privately owned casinos ever pass, an Arkansas Gaming Commission would be created with a five-member group. Adapted, devised, or designed for the purpose of playing any game of chance; or at which any money or property may be won or lost. Upon conviction, a person who violates this section is guilty of an unclassified misdemeanor and shall be fined in any sum not less than one hundred dollars and may be imprisoned any length of time not less than thirty days nor more than one year. As you can see in both instances, the penalties they charge aren’t too harsh but breaking the law is breaking the law. Poker players that get busted could always argue and make a case that poker is a game of “skill” and not “chance”. Will Arkansas Regulate Online Poker? Many people believe Arkansas will not pass legislation anytime soon to regulate online poker since they are pretty strict on their gambling laws. That very well could be the case but things can always change. *Update on the below three paragraphs – it has been learned that state casinos play a significant role in the passage of legal and licensed state online poker. Poker site operators needs to partner with a state land-based casino, which Arkansas does not currently have. The reason Arkansas would be a good candidate to regulate and tax poker over the internet is because they do not have/allow commercial or Indian casinos. This is a huge hurdle they don’t have to jump over since many other states are concerned about the battles/legal battles they would face with in-state casinos, particularly the Indian casinos. Other states with Indian casinos have state and federal laws in place which could cause major headaches for them when trying to regulate online poker. Many Indian casinos will feel they are going to lose a significant amount of revenue if such a bill was passed and executed. Basically, people would rather play poker from the comfort of their own home and no longer want to walk in the casino doors. With that being said, Arkansas would be a great candidate to pass poker online, and they could pass it in a much quicker time-frame than most states not having to deal with the “casino” issues. They are one of thirteen states in the USA that do not allow commercial or Indian casinos in their state. The others being Georgia, Hawaii, Kentucky, Maine, New Hampshire, Rhode Island, South Carolina, Tennessee, Utah, Vermont, and Virginia. 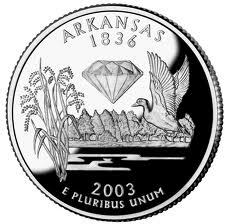 State Lottery – On November 4, 2008, Arkansas voters approved to establish a state lottery, the Arkansas Scholarship Lottery, and legalize the sale of lottery tickets. Ticket buyers must be at least 18 years of age, and the Arkansas Scholarship Lottery Act established a Commission to oversee the operation. The purpose of the Arkansas Lottery Commission is to oversee the operation of a lottery whose net proceeds will provide scholarships and grants to Arkansas citizens for in-state colleges and universities. Scholarships are to be available for nonprofit, public and private, two and four-year colleges and universities. Pari-Mutuel Wagering and Racetracks – For more than fifty years, pari-mutuel wagering was the only legal gambling activity in the state of Arkansas and is regulated by the Arkansas State Racing Commission. Bets placed by players are playing against other gamblers and not on the gambling house. Payoffs are made from this pool and divided among the winners. Click here for a complete guide to the wagering Rules and Regulations. Arkansas has two race tracks, Oakland Park in Hot Springs and Southland Greyhound Park in West Memphis. A $37.4 expansion project was completed at Southland Park Gaming & Racing in late 2014, which has brought their total gaming machines to 1,950. In 2014, Oaklawn Park and Southland Park generated $3.53 billion in gross revenue ($235 million net). They paid-out 93% of their gross winnings, with an average of $3 million per month going to state taxes. Arkansas’ horse racing and greyhound racing play a big role in tourism promotion and publicity.